According to the study, there is a significant difference between generations, with some age groups far more willing to have a go at jobs themselves around the home. The younger homeowners, aged 18-34 years, were found to not feel comfortable performing a number of home improvements, from installing curtains to hanging pictures. When it comes to painting, only 37% of those aged 18-34 years old are confident enough to decorate themselves. Less than a third (30%) will change their own light fixture and only 19% would be comfortable putting up a curtain pole or blind. Similarly, less than one in five (18%) would hang their own pictures and only 16% would build their own flat pack furniture. 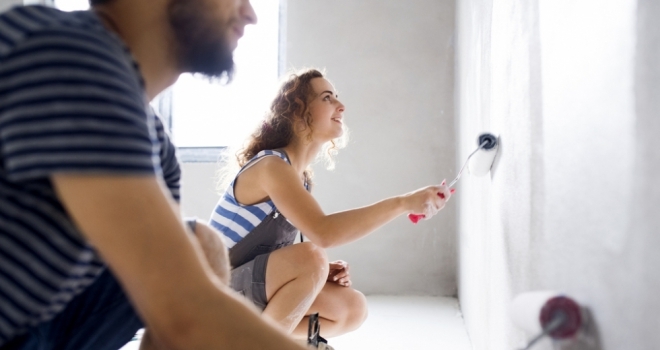 This lack of DIY confidence is proving costly for young homeowners as the average cost of a painter and decorator is nearly £300 and getting a handyman to put together flat pack furniture for you will set you back around £70. The percentage of 18-34-year-old homeowners who admit they would get a professional in are paying an average of £102.20 for a professional to do one small DIY job. Costas Kariolis, Head of Digital Marketing at Anglian Home Improvements, said: “It’s really positive to see that so many homeowners are planning on carrying out home improvements this year, whether they’ll be doing it themselves or getting in the professionals.